With redundancies rising and job vacancies shrinking, unemployment is back in the headlines. As part of a series on Britain's jobless, one man laid off because of the downturn explains how and why lack of work has touched his life. Mike Kirkham-Jones, 46, hasn't worked since September, thanks to the credit crunch. The situation means he is living apart from his family while he searches for work, and facing important choices about which direction to go with his life and career. It's not the first time redundancy has darkened his door, but this time he joins a queue of unemployed people that gets longer by the week. Like thousands of others in a similar position, Mike is someone the government wants to get back into work quickly, before they lose touch with the labour market. Mike, who lives near Newport in south Wales, was told in August he was losing his £40,000-a-year job as an operations and project manager in a small software company. Orders had started to nosedive along with the economy, and it had been "on the cards" for months that some people would have to go, says Mike, who had worked there for 18 months. He thought it would be a few weeks - maybe a month - before something else turned up, but he is struggling to find another job in IT. "Fear has started to take over now. Since being made redundant it's become obvious that the jobs aren't out there. And what jobs there are, an awful lot of people are applying for them," he says. 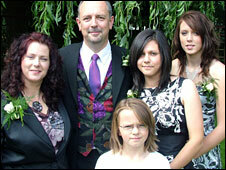 Mike, who has a wife and three daughters, knows that they could be worse off. Last year they sold their home - albeit at zero profit - paid off their debts, saved the rest, and chose to rent instead. Their house was falling apart, they could see signs of the property market sliding, and Mike's previous three-year spell of unemployment had put them in fear of holding on to debts. They would like to use the money they kept to buy again in the future. The fact that they have those savings now precludes Mike from claiming Jobseeker's Allowance. "Last time I was made redundant we didn't have that money - although we owned the house - so I was able to claim. I've realised that if you are honest you don't seem to get very much. "But I've never felt the state should help me, I don't really think that way." Now, with no job and no permanent home, it's decision time for the family. Mike's real love is painting. He produces landscapes and some portraits in his spare time and had begun selling some paintings and running art courses last time he was out of work. He also has experience of self-employment, after running his own IT firm a few years ago, and has thought of doing so again to escape his current situation. But if he abandoned the job search and instead set up a business, he asks, would it survive when bigger companies are floundering? Mike and his wife have also thought of leaving the UK to live abroad, but wonder if they could make a living overseas that would take them comfortably towards retirement. He is at a junction and doesn't know where to turn. He frequently wakes in the middle of the night, his mind spinning. "We're in a limbo situation where I don't know what job I'm going to get next." The family have already eaten into a third of their savings, and as they hurtle towards Christmas with no money coming in, that balance will only diminish further. To add to the stress of job seeking, Mike and his family are living miles apart so he can search for work without unsettling the younger children. His wife and two of his children are living in a holiday park chalet in western Wales - an area into which the children had become settled following a previous move, before Mike got his last job. Mike and his older daughter - who is doing A-levels in Newport - are meanwhile sharing a flat with his brother in nearby Cwmbran, to keep costs down while he searches for a job. The family had been living apart during the week for some time, since Mike took on the job at the software firm, and were on the brink of finding a permanent place to be together again when he was made redundant. As a stop-gap, friends agreed to let his wife and daughters let rent a chalet on a holiday park in western Wales, temporarily. "That 'temporarily' has gone on and gone on. I can't move everyone until I know where we where we were going to be based," he says. The family have to be out of the chalet by the time the park shuts for a couple of months at the end of December. Meanwhile Mike spends most weekdays trawling the internet for IT jobs in Wales, England and overseas, applying for vacancies and sending out speculative CVs. Simultaneously he's talking to contacts about the potential of an art business. "I'm trying to keep busy, trying not to get stuck in the house or start moping around." At the weekends he heads off to the chalet to be with his family. Mike's wife - a trained radiographer - has looked for casual work in west Wales, but the options are limited and even the local supermarkets have stopped recruiting. She is also limited by their remote location, which means a 70-mile daily school run. "My wife's okay at the moment, she was very very depressed when she heard that I was made redundant. It's been much harder for her." They are planning on renting a house to be together for Christmas because the chalet - designed for summer weather - is becoming too cold to tolerate. "We just want somewhere to sit down and enjoy life. I don't think there's any perfect family life, but somewhere to put a Christmas tree up would be nice."